In the next week or so, an extremely early "beta" of a game I've been working on in my spare time will be hitting the Ape Apps Launcher and Ape Web Apps. This is a new single or multiplayer game that is sort of like my game Gone Rogue merged with Minecraft. Essentially, you create a new world, and then you join it with an avatar you created using the My Tokens app. 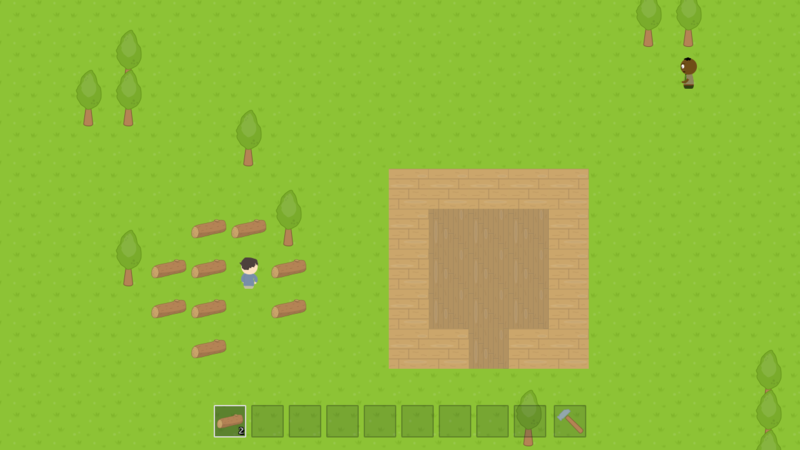 You start with a completely uncivilized world (no pre-built structures), and you have to gather natural resources and craft them into materials in order to build up your world. The game is 2D top-down world view and controls like Gone Rogue, but a lot of the gameplay elements are like Minecraft. I plan to have random dungeons generated throughout the world using similar level generation algorithms as Gone Rogue, but the actual world is potentially infinitely big, as there is no set limit on how far you can walk, and new sections of world are generated as you go. On the Web, the game is single player, and on the Ape Apps Launcher (and mobile devices, once released), it supports LAN multiplayer, or direct connect to another player over the internet, if you know their IP. So anyway, it's just a simple(ish) little concept game at the moment. I've had the concept in my mind since I came out with My Tokens, but am only now deciding to throw it together. A lot of the base framework for the game is done, as well as the multiplayer code. I am just needing to add more resource stuff to mine and whatnot. Yea I want to see this game. Can't wait to see it released. Minecraft and My Colony are my favorite games, and this looks like another game about building and being creative. It will be on Ape Apps Launcher as a beta in the beginning of November, with multiplayer included.